Now you can read the eBook on your favorite device. Flynn’s memory is hazy. He wakes up in a strange world and faces two huge surprises. First, his body has transformed. He is no longer a human. He is a Minecraft character! Second, he is totally alone. Will Flynn survive? How did he get in Minecraft? Can he get out? Find out! 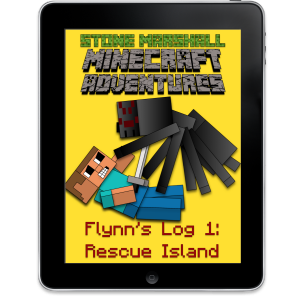 Read Flynn’s Log 1: Rescue Island, the first book in the series, Stone Marshall Minecraft Adventures. This is a challenging, thought provoking epic Minecraft book adventure series! You will get in the mind of Flynn. You will adore Verve, be uncertain of Zana and wish you could help Flynn. You might even learn a few Minecraft tricks! Written and Illustrated by Stone Marshall.